This AD is for the a bundle of 12X brand new Green Garden PL-244W total of 12x 4x4 outdoor garden solar powered LED Light set for fences, posts,deck, railing etc. These Green Garden PL-244W Solar Powered Lights illuminate the perfect amount of ambient light for your outdoor scenery. the lights run on Solar powered, so no wiring or electrical use is required. You can use the Green Garden PL-244 lights for any type of use,such as design a whole new look to your yard or patio, add some light to all your posts, or even having light around your flower bed. Make you lawn stand out from the rest and give it an appealing look. These lights will fit on 4" X 4" posts and has a controllable on/off switch for you. Order the 12-pack PL244w Fence post white solar lights here and Save, this same bundle is sold more expensive everywhere else but here you will save because we do not have to pay selling fees and we pass the saving to you. Enhance the look of your yard - fence - balcony etc and give an attractive look by adding nice solar lights - easy to install. Solar light is the new trend for the 21st century they are easy to install no wires required, basically anyone can install them. They are powered by sun light and are portable which means you can install them at your house or you can take it anywhere you need to decorate your yard,fence, balcony etc where conventional electricity is not available or hard to get. Please Note: This 4x4 solar lights fit perfectly 4x4 PCV Vinyl Post - If you install them on 4x4 wood post there will be a small gap because 4x4 wood post actual dimensions are 3 1/2. 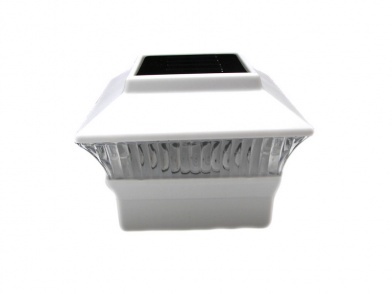 Opening Dimensions: 4 1/16" x 4 1/16"
Buy these 12 Pack Outdoor Garden Solar Powered Light to enhance the look of your Garden , Yard, Patio, fence etc. We know our product and if you have a question or need Customer Service we are available via phone or email, most big eCommerce sites do not have that option. Click the button below to add the 12X PL-244W 4x4 LED White Outdoor Solar Powered Plastic Post Deck Square Fence Lights to your wish list.